Found in the southwestern region of Indiana, Newburgh is the home of some three thousand plus citizens. This Warrick County town is found just off the Ohio River and only minutes away from Evansville, Indiana. Although it had been inhabited by native people as early as the 17th century, Newburgh wasn’t officially founded until 1829 by Abner Luce, and it was later merged with a neighboring town to grow in size. Due to benefits such as great coal mining land and an incredible location along the river (Newburgh was one of the largest riverports in the area after being founded), the area was known for its prosperity and was a common destination on the Underground Railroad. This lasted until 1850 when Newburgh became the first town north of the Mason-Dixon Line to be captured by southern Confederate forces during the American Civil War. Today this quaint town is a center for nostalgia and historic commerce and activities. Along the riverfront, you’ll find many historic shops and small businesses, many of which are run by families that have been in the area for generations. Some of the most well-known establishments in the area include the Newburgh Country Store, Angel Mounds State Historic Site, The Exchange Hotel, Newburgh Lock and Dam, Alcoa Corporation, Old Newburgh Presbyterian Church and the Original Newburgh Historic District (both of which appear on the National Register of Historic Places), and many small, local businesses. 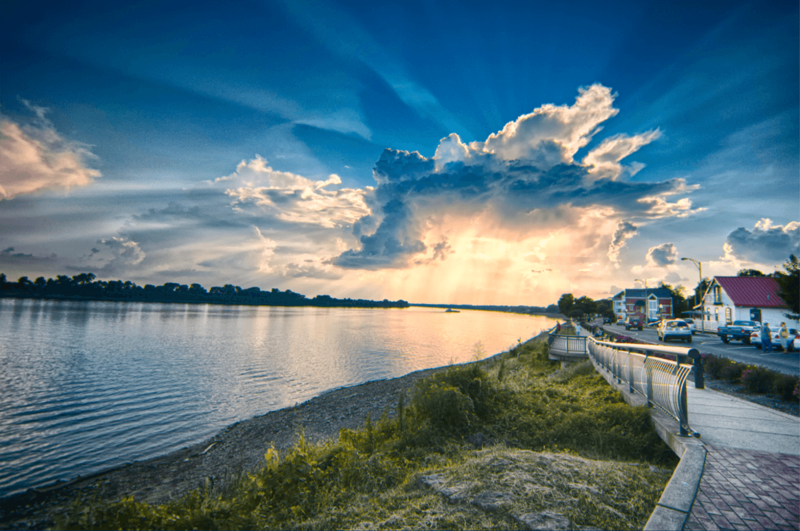 Newburgh’s riverfront today acts as a community area used for walking dogs, hosting events (such as the annual Strawberry Festival, October Ghost Walks, or the Newburgh Wine, Art, & Jazz Festival), enjoying the weather, meeting with friends, and so much more. Coupled with the extensive list of trails, parks, and playgrounds in the area, Newburgh’s entirely A-rated school system provides an excellent environment for education and acts as another feature to attract families to the area. With its close proximity to the much larger Evansville, Newburgh is a residential destination for many people commuting to other areas for work. In terms of its housing, Newburgh contains a plethora of architectural styles. While many of its buildings in the historic district utilize even older styles, common residential varieties include Italianate, Greek Revival, Classical Revival, and many more.